Honestly, the most amazing thing Griner did last week wasn’t even that visible. For both the draft and her SI.com interview — during which she wore glasses, a blue gingham shirt, and a dotted, ivory bow tie — Griner did something lots of women do, something that bestowed a bit of glamour to basic grooming. Brittney Griner painted her fingernails. In fact, she painted them a shade of orange that might have been awkward had she been picked up by, say, the Atlanta Dream instead of the Mercury. Doing your nails is one of those superfluous cosmetic flourishes that, on most women, is purely fun — if you’re an American sprinter at the Olympics, it’s the most fun of all. But with Griner her orange nails were playful in a different direction. They feminized her menswear — she wore a fetching white tuxedo on draft night (the vests, the neckwear, the dress shirts, the slacks) — but they didn’t sell it out. They defused her look, they delivered Griner’s masculinity from drag, from performance, from posing into nature. They told you she’s not playing or pretending with these clothes. She’s just being. In 10 years, the suits and shirts won’t change, they’ll just be made of nicer fabrics and fit better. On the one hand: They’re just fingernails! On the other: Even as an evanescent acknowledgment that Griner’s going to play basketball for a team that uses a lot of orange, the nails altered the perception of her personal properties, softening a hard (and seemingly hard-luck) woman. They also get at the current political complexity of sexuality in sports. Right now, the media is conducting a comical stakeout of closet doors across all professional sports. For weeks, there have been rumors. One major athlete is going to announce he’s gay! It’s going to be Manti Te’o! Oh, he’s saying he’s not gay. Wait, a whole superteam is going to come out? Simultaneously! Instead, we got vacation photos of the former New York Jet and Arizona Cardinal Kerry Rhodes, happy with his arm around another man. But there was no kind of official word, only Rhodes’s denials. So with the sports world basically playing Richard Dreyfuss and Emilio Estevez to some unknown but not unwitting sports star’s Madeleine Stowe, athletes like Griner, the aspiring NFL kicker Alan Gendreau, and the soccer player Robbie Rogers enter the conversation almost unheralded. In Griner’s case, her nonchalant status update has inspired a few columns that call her an inspiration. But one reason her anti-announcement announcement wasn’t a bigger deal to the media was because it wasn’t a big deal to her. This isn’t to say that the shift Griner represents isn’t a big deal. It’s that the signifiers don’t attract the sports media; for four years at Baylor, Griner was putting off obvious coded signals. She stands 6-foot-8 and would be the baritone in a barbershop quartet. At last year’s ESPYS she worked the red carpet in gray striped pants and a matching vest alongside the smaller, underdressed Robert Griffin III. (He wore pants with a dress shirt and tie.) They looked like two buddies, with similar long, twisting hair, on their way to pick up their respective girlfriends. I checked Twitter while ESPN had them on. No one really seemed to know what to say. Griner is entering the WNBA with Layshia Clarendon and Toni Young, both of whom attended the draft in clothes — a bow tie for Young, a skinny tie, blazer, and puffed Mohawk for Clarendon — you see both on male rappers and certain black prepsters in gay nightclubs. But like Griner, neither Clarendon nor Young were in drag. Regardless of their sexual orientation, what they wore appeared to be a natural extension of whoever it is they are. Their clothes made sense to me because their clothes appeared to make sense to them. It isn’t that you can’t still find what, on a recent episode of Millionaire Matchmaker, a lovelorn lesbian chef named Khristianne called a “butch in the streets, femme in the sheets.” It’s that these girls don’t appear to be hiding anything. They don’t seem to be experimenting. Sometimes with the guys in the NBA the experiment is all you feel. It’s exciting to see them out there taking risks, but you often don’t know where style ends and being styled begins. Griner isn’t exploring. She knows. If Griner wants to wear orange nails with her white draft-day tuxedo, it doesn’t matter that she might look like what you’d find on a deluxe ice cream truck. She’s proof that the boundaries have changed. 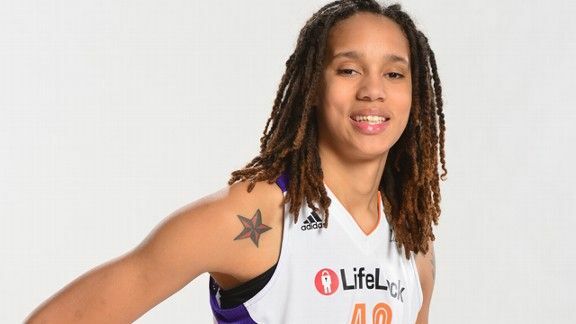 Griner and those nails are a subversive marker of the small but increasing genderlessness in professional sports. It isn’t simply that the women are dressing like men. It isn’t even that the men are dressing like women. But a handful of athletes are allowing the lack of distinction you see on the fashion runways and on the streets of the world’s major cities to play out in a Russell Westbrook press conference in Oklahoma City or the skintight sweaters and pants we’ve seen on Dwyane Wade. There’s little sartorial difference between Janelle Monáe and Me’Shell Ndegéocello and LeBron James and Amar’e Stoudemire. But the gay coding extends beyond straight athletes who dress like lesbian musicians. The pitcher Brian Wilson has treated his years as a San Francisco Giant as an opportunity to paint his fingernails and explore assorted permutations of gay facial hair. At some point his black beard mutated into a roiling, oily nimbus. Somehow, he achieved the inviting menace of an organic farmer with a pleasure garden on Castro Street. But that’s not the world in which these athletes are living. Anyone “coming out” now is probably a lot more like Griner and Gendreau and less like Jim McGreevey, the former governor of New Jersey whose sexuality was dragged before the media nine years ago, or Jodie Foster, who, in January, used the occasion of a lifetime achievement award at the Golden Globes to contort her way out of the closet. This younger generation of gay athletes — accustomed to degrees of cultural, social, and legal inclusion — better knows the relative personal normalcy of being gay than the crisis and melodrama of telling the world you’ve been living a lie. More and more straight ones have gay friends, classmates, cousins, siblings, and parents. The political groundwork’s been laid by the Billie Jean Kings and Martina Navratilovas; the cultural groundwork by Marlene Dietrich, Annie Lennox, Alvin Ailey, Grace Jones, pretty much anything on MTV in the 1980s, Dennis Rodman, and, most crucially, Ellen DeGeneres, she of the acclaimed coming-out and the iconic pants and vests. That’s the other thing about this class of gay athletes. They’re not out to challenge any status quo. The forebears met the challenge so that Griner doesn’t have to fight as vociferously. Coming out will eventually become this vestigial rite for inhabitants of the LGBTQIA universe. There was never truly any in. Even without the existence of this desperately sought-after gay messiah and with so much extant chopped liver (somewhere the Minnesota Lynx’s Seimone Augustus is furiously waving her hands; she’s engaged to marry her girlfriend), professional sports has never been as culturally gay as it currently is. All the sartorial signifiers are there. I have a 15-year-old niece who plays varsity basketball in Wilmington, Delaware. She’s openly gay, thinks Griner’s clothes are a much bigger deal than Griner’s homosexuality (“duh,” she says about that), and counts as a hobby posting on Instagram photos of herself trying on outfits — dress shirts; cardigans; porkpie hats; horn-rimmed glasses; chukkas; saddle shoes; slim, low-rise khakis; each garment in every imaginable color. She competes with her friends to see who wore what best. We were driving one day when I told her she and her friends reminded me of the men in the NBA. “You know, you guys are dressing just like Russell Westbrook and James Harden and the rest of those guys,” I said. The reason for the obsession with men comprises different kinds of sexism that basically amounts to the institutional acceptance of sports being a masculine pursuit. The many, many women who play do so as Eves competing with Adam’s rib. But it’s also that for a man to be gay in sports is less than manly. The same is true for combat — but the military has a federal law that protects against that discriminatory perception. Professional sports has Dan Savage, Scott Fujita, Brendon Ayanbadejo, and Sean Avery. For women, the level of interest might be different if a star came out who was as conventionally beautiful as Elena Delle Donne and Skylar Diggins.